Have you given up on exercise because it’s too hard or you have too much pain? Have you ever wondered if the Power Plate could help you feel stronger and more confidently balanced? Have you felt you didn’t have enough time to really put the extra edge on your fitness? Have you thought how can one machine serve both the fit and unfit needs? The Live Like You Can Gym may have just the answer for you. Please join us for an informative demonstration and hands-on experience of the Power Plate Vibrational Training Machine. Janis McDonald, Owner of the Live Like You Can Gym is holding this special event with Joe Hernandez, Power Plate Professional. Opening our doors for you, we will answer these questions and many more during our talk and demonstration. For example, people who were too overweight to execute enough exercise to make a difference, people whose pain levels prohibit them from moving freely and people with neuro-muscular disease or post-stroke whose bodies have diminished activation of nerves resulting in weakness. Other research-based findings support results of increased bone density, enhanced circulation for pain reduction, boosting of the neuro-muscular system while training “the aging muscle fibers,” improve balance, flexibility and most importantly, increase strength. Power Plate has served people of all ages, allowing them to train their bodies effectively without loading and repeated bending of joints. Even if the body doesn’t move well, the Power Plate can improve confidence in walking, strength in climbing, improve balance and boost physical power. 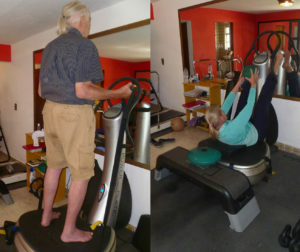 Our oldest client yet, Arthur Weiss (95) never missed his Power Plate workout. He loved the experiencing his stair climbing ability getting stronger with each workout. The Power Plate versatility is simply amazing. Not only does the machine meet the needs of people with problems, vibrational training can put the fitness edge on high-level training. For example, the NFL, Olympian athletes, NASA, professional golfers, tennis players and boxers use the machine. Please Contact Us for Your Free Demo! Power Plate works by vibrating between 25-50 vibrations per second in vertical and horizontal planes applying G-forces to the body. The muscles accommodate to the complex motions bringing dramatic improvements in strength, balance, flexibility, leanness, power, tone and circulation. Stimulating your muscles and nerves resulting in more work done by your body in a shorter period of time. Both beginners, elderly and trained athletes can make great gains on this machine because of the wide variety in speed, vibrations, exercise difficulty and load. Janis McDonald, Master Functional Aging Trainer and Certified Wellness Coach.